Well this is a hard review to write. About three hours before the end of Bioshock Infinite, I had a laundry list of complaints that I was planning to deliver. 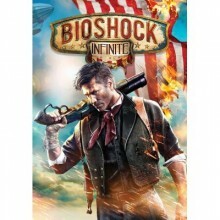 Why do people like Bioshock Infinite so much? Why is this considered “revolutionary,” or “one of the best games of this generation?” I kept asking myself both of those questions during most of my playtime until the third act got started. Then I stopped asking questions and just stared at the screen, slack-jawed, until the credits rolled. It’s not that the first two-thirds of the game are bad per say, but in some ways a lot of the core gameplay of Bioshock Infinite can feel painfully average at times. Without a doubt, the story is by far the best part of Bioshock Infinite. You are sent to rescue a girl named Elizabeth from a floating city, and well, I’m not going to spoil the rest. Engaging characters, and interesting narrative, emotional resonance, plot twists that were actually, well twists. It is also very hard to talk about without spoiling. The plot of Bioshock Infinite is one of those things that is best experienced in a vacuum. The presentation, the set pieces, everything about the story and how it is told is fantastic and will hopefully serve as a model for videogame storytelling in the future, much like the original Bioshock did. It can be a little bit confusing at times though, and there is so much veiled foreshadowing going on that the game actually makes a lot more sense the second time you play it once you have something of an understanding as to what is actually going on. As far as I am concerned, the story of Bioshock Infinite is more than worthy of joining the pantheon occupied by Spec Ops: The Line, The Witcher 2, and of course the original Bioshock. Gameplay is where the problems start. For the most part the mechanics of Bioshock Infinite are almost completely unchanged. This is not a good thing. Technically speaking, the combat of the original Bioshock was average. There was nothing technically wrong with it, but it lacked a certain punch, and felt a tad clunky when the action started to get really intense. Bioshock Infinite adds iron sights and scopes on most of the guns, and that is basically all that changes. Another problem is body presence: Booker feels like a pair of floating arms and not a real person at times. I know that this is a pet peeve of mine and doesn’t bother most other people as much, but this is 2013, and when I look down in an FPS, I want to be able to actually see the rest of my body, not empty air. When you use the skyhook (more on that in a bit) you can’t actually see your arm once you hook onto skylines, you just hover there. The “first person ghost” effect hurts the experience by occasionally destroying immersion. There was one scripted sequence where you are fall off a blimp and grab Elizabeth’s hand before hooking onto a skyline. At that point you can look around, but you can’t see your arm holding the skyhook, and you can’t see Elizabeth even though you can hear her screaming. Yes, it was very jarring. In some ways, the gameplay actually detracts from the story. In the original Bioshock, the mechanics served as a metaphor for the entire situation. Scavenging for food and ammunition made sense in a place that had gone to hell as was filled with genetically modified psychos. In Bioshock Infinite it just feels bizarre to be picking through every single desk and trashcan you run across for meager amounts of food and ammunition, and looting corpse in the middle of combat for much need ammo quickly becomes rather annoying. And yes, the violence is out of control. It quickly gets tiresome and it adds nothing but padding. There is a boss that only fights by spawning more enemies that you have to kill THREE TIMES. It’s just hard to accept a character being shocked after observing a single violent act when just before it happens she watched as you gunned down sever dozen men before grabbing another and SHOVING THE SKYHOOK THROUGH HIS GODDAMN EYEBALL. Bioshock Infinite is not Spec Ops: The Line. Bioshock Infinite is trying to tell a different kind of story, and one that is not dependent on ultra violence. I would have much preferred game mechanics closer to those of Deus Ex: Human Revolution with options for stealth and persuasion rather than the endless gunfights that Bioshock Infinite delivers. That being said, the gameplay isn’t actually bad, and speeding around the battlefield with the skyhook and charge plasmi- I mean vigor can feel pretty exhilarating at times. Graphically speaking, Bioshock Infinite looks pretty nice. Most of the time. The view in general is fairly pretty and the draw distances are fairly impressive. That being said, I did notice a few muddy textures, and while the game did run a 60fps at 1080p with medium settings, I did notice a few drops in framerate every now and then that seemed to happen for no reason. Several dozen enemies on screen in an outdoor area? No problem. Look at a boor in a basement? Enjoy a sudden, jarring 20fps drop. There is a pretty good options menu on the PC version that includes an FoV slider, and that is really all I have to say about this. Honestly, there really isn’t much to say about the graphics in Bioshock Infinite; they are just there. In some ways, Bioshock Infinite inspired some… Irrational feelings of anger during the earlier parts. I was annoyed with the game for the first few hours that I spent playing it just because of the tedious ultra-violence. That being said, the sheer awesomeness of the story eventually won me over. It’s worth noting that I am still thinking about the game several days after I finish it, and I will probably be playing through it again in the near future. Irrational Games clearly spent most of the development time on the story, and in a way the resulting lack of synergy between story and gameplay is disappointing. But is it disappointing enough to prevent the game from being on of the best interactive storytelling experiences of this generation? Absolutely not. If you enjoy a well told story that will turn your head inside out and you don’t mind a bit of very average gameplay, go buy Bioshock Infinite. Now.